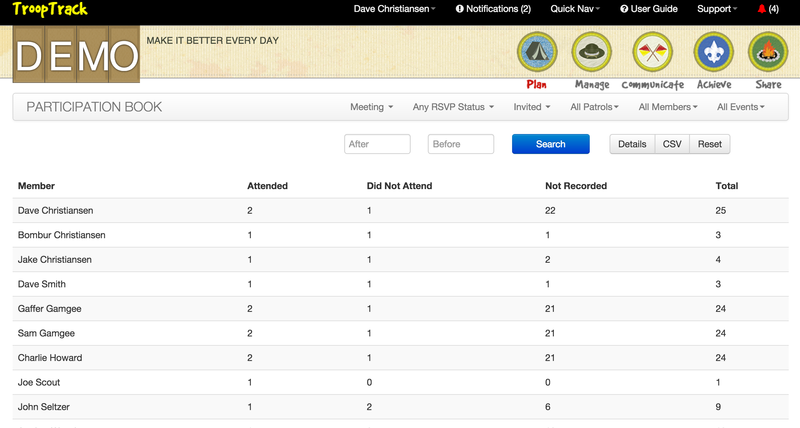 Have you ever wanted to see who had perfect attendance at your meetings or campouts? With the new summary view of the participation book, GOING LIVE RIGHT NOW, it's a breeze. All you need to do is go to the participation book (Plan -> Participation Book), then filter by event type, add a date range if you want and click search. Then click on the "Summary" button to see a summary of your results. Check out the screen shot below to see the results.